RSyntaxTextArea, AutoComplete, LanguageSupport, RSTAUI, and SpellChecker all have had version 2.6.0 released today. These releases include the typical minor features and bug fixes, but also note the migration of these libraries to Java 6. Starting with 2.6.0, RSTA and friends will require a Java 6 JVM to run. This should be more than fine, considering it’s 2016. Folks requiring Java 5 compatibility can continue to use the 2.5.x releases. Grab them from Maven, GitHub, or SourceForge. http://forum.fifesoft.com no longer exists. I could simply not keep up with the amount of spam posted to it, and the GitHub site is a much better place for Q&A and bug reports anyway. In the upcoming 2.6.0 release of RSyntaxTextArea, I’m adding a feature that I like that’s in IntelliJ IDEA. This allows you to quickly see the scope of the block your caret is around, without having to scroll up in the editor. If the line containing the matching brace is only whitespace and the curly brace, the line prior to that one will be in the tool tip as well (for code written in K&R style, for example). This feature is enabled by default, but can be disabled by calling textArea.setShowMatchedBracketPopup(false). RSyntaxTextArea and all of its sister projects have a 2.5.7 release onGitHub and Maven! These releases fix up some issues found in the latest 2.5. * releases, and made improvements to the Sonatype integration, as well as CI and unit test coverage. So it was mostly an organizational release, and to “officially” ship a few fixes and features that had made it in the past few months. Check it out! Posted in RSyntaxTextArea | Comments Off on RSyntaxTextArea 2.5.7 Released! In an effort to encourage the writing of unit tests for RSTA, I’ve added CI builds and coverage reports. You can see the status of these things in the RSTA README.md file. 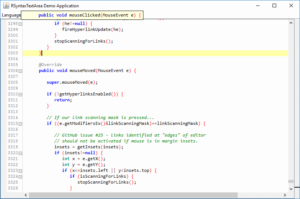 Yes, the code coverage is terrible – that’s why I’m doing this! Hopefully a little public shaming will spur some improvement in this area. The CI is done through Travis-CI, and the actual coverage reports are generated by Jacoco and hosted on coveralls.io, but the yucky details of all this are hidden by Gradle and an awesome gradle plugin. All of this is currently only set up for the main RSyntaxTextArea project. If everything works out swimmingly I may enable it for AutoComplete and other projects in the future as well. RSyntaxTextArea and RSTALanguageSupport have a 2.5.6 release on GitHub and Maven! These releases fix up some issues found in the recent 2.5.4 releases. They are compatible with the 2.5.4 releases of AutoComplete, RSTAUI and SpellChecker. RSyntaxTextArea in particular is worth upgrading if your application runs on OS X, because it brings a big performance improvement with rendering tokens with background colors specified. Moving forward, I hope to more strictly follow semantic versioning, but I give no promises. But the goal is to no longer tie myself to synchronous releases of all of the RSTA sister projects at once. All of 2.5.x, for example, should be obviously compatible with one another, and indeed, 2.x should as well. We’ll see how that goes moving forward. RSyntaxTextArea 2.5.4 (and all of its sister projects) are now available on GitHub, Maven and SourceForge! The biggest change for all projects is the migration from Ant to Gradle for builds. The primary motivation for this was to make it easier to create artifacts to put into Maven Central, as well as to tinker with something new. Thus, this is the first release where everything is available in Maven on day 1! Moving forward, artifacts in Maven will be a standard part of the RSTA release process. But besides Maven integration, some other goodies were added too, such as syntax highlighting and code folding for Dart and D, as well as simple code completion for XML files. Check it out!